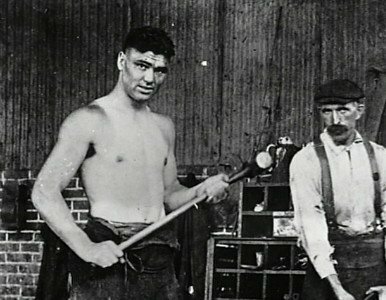 Jack Dempsey is known throughout the world as one of the greatest heavyweights in history. Very much a man way, way, way ahead of his time, Dempsey’s crouched, ultra-aggressive approach shocked audiences; his naked aggression being seen as “uncivilised” and “barbaric” in its nature. Yet Dempsey was hugely successful as a prizefighter, eventually capturing the world title and in time becoming a true hero. But Jack’s rise to the top was far from straightforward. Dempsey, who turned pro at the age of 19 (officially anyway) in August of 1914, failed to get a win. Dempsey instead had to settle for a six-round draw with a fellow named Young Herman. There was another draw for Dempsey the following February, to Laverne Collier, over four-rounds, and then, in April of 1915, Dempsey suffered his first pro loss when he was decisioned over four by a guy named Jack Downey. While in May and June of that year, Dempsey was twice tied by Johnny Sudenberg and then, in December of 1915, he was held to a second draw by Downey. Dempsey suffered his setbacks, sure, but he was never knocked out or stopped during these raw, early and very hungry years. Until he ran into a guy named “Fireman” Jim Flynn, that is. Dempsey himself, to his dying day in 1983, denied taking a dive; on a few occasions saying that when he extended both gloves to touch ’em up with Flynn before the action legally began, Flynn cracked him with a hard and heavy right hand cheap shot and knocked him out. The large crowd contained many fans who were outraged with the farcical affair. So, was Dempsey (albeit a young and raw, far from polished fighting machine the kind he later became) legitimately KO’d or not? Sadly there is no footage of the 101 year old fight. Nor is there any film of the return, which took place exactly 100 years ago today – February 14, 1918; Saint Valentines Day. Dempsey got his revenge in the fight staged in Fort Sheridan, Illinois, as a wicked body shot hurt Flynn, with a rampaging Dempsey following up and knocking his man out of the ring; Flynn literally left in pieces among the ringside fans. The time was 1:10 of the first. Dempsey had managed to wipe away the only KO loss that would ever appear on his pro record. Later, in July of 1919, some 17 months on from the Flynn rematch, Jack savaged Jess Willard to take the heavyweight crown. To some critics, though, the loss, the KO loss, to Flynn prevents Dempsey from being ranked as highly as he is by most everybody. Again, what a shame there is no footage of either Flynn fight, the first one in particular, so that we might examine and make up our own minds. Flynn, a tough and durable light-heavyweight, twice challenged for the world heavyweight title: being stopped in the 15th round by Tommy Burns in 1906, and being disqualified for constantly headbutting Jack Johnson in 1912, the fight being halted in the ninth-round. Flynn’s official final record reads a quite amazing 47-53-20(33). He died in April of 1955 aged just 55.